Swiss company PSI combine traditional and modern design practices to deliver a monitor that is both powerful and extremely revealing. 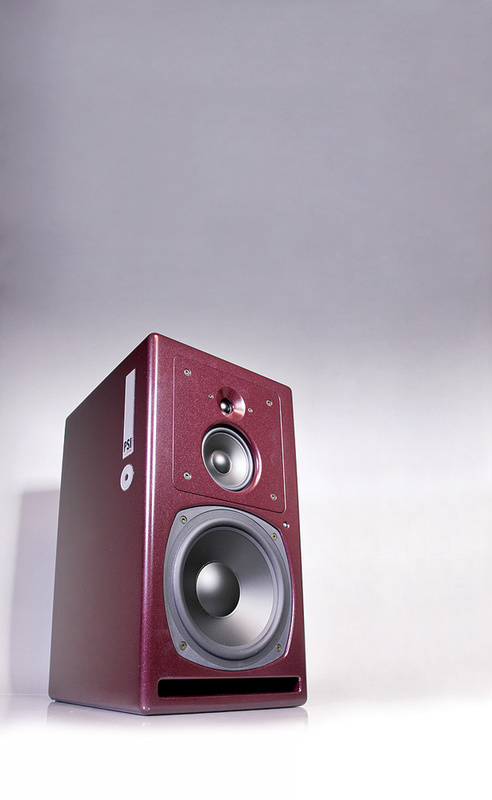 Swiss monitor manufacturers PSI have made one previous appearance in the pages of Sound On Sound, back in July 2011. On that occasion, Hugh Robjohns was highly impressed by their A17M and A21M active nearfield monitors, so when the opportunity arose to try the company's most ambitious design, the three-way A25M, I didn't need asking twice. Having said that, I will admit to a moment's regret when I helped the delivery driver carry the two boxes down into my basement, because the first thing that's apparent about the A25Ms is their weight. They are not only very heavy, at 28.4kg each, but have the kind of proportions that make a one-person lift of such a weight risky, and a two-person lift, well, just a little intimate. I'm always warm and welcoming to delivery drivers, but there are limits. The size and weight of the A25Ms mean they will probably not be considered for nearfield duties by the majority of potential users. At 590mm x 320mm x 380mm, they are too large and too heavy to stand on any meterbridge I've ever seen, and while wall-mounting with brackets might be an option, I'd want the brackets installed by somebody who truly knew what they were doing. And if the wall is not of the solid, brick-outhouse variety, forget it. Realistically, then, the A25Ms fall into the mid-field category — somewhere between main monitors and nearfields — and will, I suspect, most often be found perched on top of speaker stands away from any walls, which is how I used them in my room. However, before I jump the gun and start to describe how the A25Ms perform, there's a fair bit to write about their design, which is an intriguing mix of the traditional and the unusual. First, the traditional. In speaker design you can hardly express more tradition than by employing a rectilinear MDF enclosure and fitting conventional drive units, arranged in size order, on one face — and that's what you get with the A25Ms. Granted, the enclosure (painted an, um, interesting maroon colour for which I don't believe a name has yet been coined) has its edges softened to reduce diffraction (a little), and the reflex port is created by an internal shelf and open slot, but these details can't disguise the fact that, in enclosure terms, the A25Ms might have been designed a few decades ago. And it's not just the enclosure that looks as if it might have been conceived back in the day. The drivers comprise a 210mm plastic-cone bass unit, a 100mm plastic-cone mid-range unit and a 25mm soft-dome tweeter, none of which suggest cutting-edge electro-acoustics. The tradition continues with the rear-panel-mounted amplifier module, which carries a mains socket, a single balanced signal input, and a couple of adjustment knobs for input sensitivity and low-frequency EQ. In describing the A25Ms' traditional elements I don't intend to be disparaging, because actually I'm a big fan of traditional electro-acoustics. Sometimes I find myself worrying that, in the headlong rush for digital sophistication in active speakers, some of the good, solid electro-acoustic principles developed in the second half of the 20th Century are being forgotten (yes, I'm sad enough to worry about speaker design). But I don't believe that's the case with the A25M's design. Its traditional nature partly reflects the fact that there's good, solid electro-acoustic engineering at its heart. That, however, is enough about tradition, because the A25M design is by no means a simple throwback to less complex times. There's much more to it than that. For example, one potentially useful feature of the A25Ms that certainly doesn't figure much in the hallowed history of speaker design is that the sub-panel carrying the mid-range driver and tweeter can be removed and rotated 90 degrees (cue somebody finding an obscure 1960s speaker that incorporated such a feature). Rotating the mid and tweeter array in this way enables the mid/high-frequency dispersion characteristics to be oriented for either portrait or landscape monitor installations (see the 'Geometry Lesson' box for an explanation of speaker dispersion and driver layout). Bearing in mind the physical size of the A25Ms, I can see some users preferring landscape orientation. Another non-traditional feature of the A25Ms, and one that I definitely applaud, is a compliantly decoupled amplifier module. Push a little on the rear panel and you can feel the whole module move against some form of suspension arrangement. There's little argument that electronic systems can be microphonic, and it's always struck me that, from this the point of view, the electronics of most active speakers could hardly find themselves in a worse place: bolted hard to the back of the cabinet and incessantly shaken by their very close drive-unit neighbours. Mounting the amplifier module compliantly on the A25Ms provides a degree of mechanical filtering, and keeps the electronics isolated from the worst of the vibration. It can only be a good thing. While I'm on the subject of the A25M amplifier module, its amplifier topology itself is far from traditional. It employs high-technology 'rail-switching' techniques (often know as Class G) to improve overall efficiency and reduce heatsink requirements. The low, mid and high-frequency amplifier sections are rated at 170W, 80W and 50W, respectively. The A25Ms are not short of amplifier power. The A25Ms' unconventionality doesn't extend only to the rotating driver module and decoupled amplifier, however. Buried inside the amplifier module are two proprietary PSI technologies that are perhaps far more significant. First up is PSI's CPR, which stands for Compensated Phase Response (maybe I've been watching too much Casualty on TV, but CPR means life-saving chest compression to me). CPR comprises frequency-dependent delay, tailored to the phase characteristics of each driver and its crossover filters. It ensures the overall system phase response varies far less with frequency than would otherwise be the case. The term 'phase' is of course another way of expressing time, and ensuring that the speaker's phase response is constant with frequency means that signals across the audio bandwidth all reach the listener's ears at the same time. This too can only be a good thing. There are a couple of caveats about CPR, however. First, the simultaneous arrival of signals across the bandwidth will only occur at a very narrow range of listening positions — where the distance between the listener's ears and all three drivers is the same. If the listener moves so that, say, the tweeter becomes closer than the mid-range driver, no amount of electronic processing within the speaker can help. PSI publish an image in their brochure of a 500Hz square-wave signal reproduced by a CPR-equipped speaker. Now, multi-way speakers are traditionally pretty poor at reproducing square waves, partly thanks to their non-linear phase response, but CPR-equipped speaker appears to do an unusually impressive job. I'd wager, however, that if the measurement microphone were to be moved to a position where the distance to the bass and mid-range drivers was significantly different, the square wave response wouldn't look so good. CPR is an interesting technology, but it can't compensate for the fundamental geometry of a conventional multi-way speaker. The second CPR caveat is that the A25Ms' phase response is constant only down to around 200Hz. From 200Hz to 20Hz the delay (phase response expressed as time), illustrated in PSI's published data, rises significantly, just as it does with almost any moving-coil speaker. What I find intriguing about this is that, having put the effort into minimising phase change using CPR, PSI then chose to employ a ported low-frequency system, with its inherently fast change of phase, over a closed-box system with its much slower change of phase. Go figure. Rear-panel controls are limited to input-sensitivity and LF trim knobs. 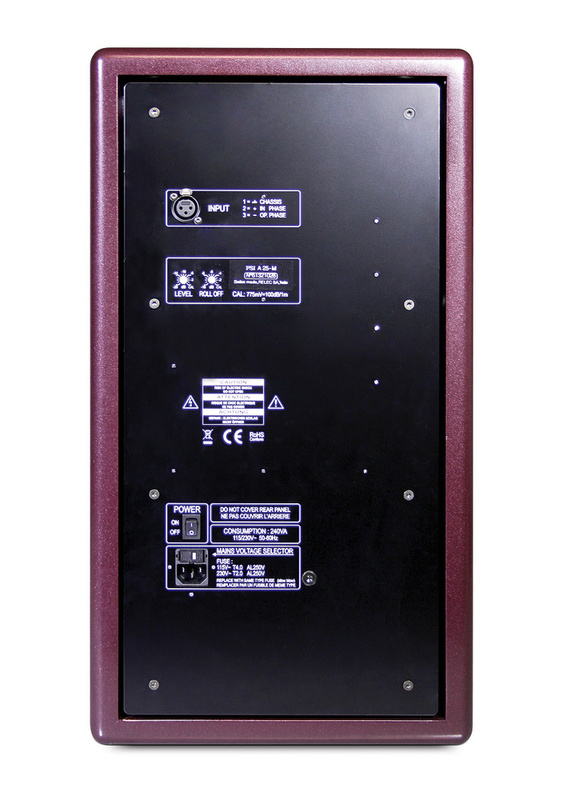 The whole amplifier pack is suspended within the cabinet, reducing its susceptibility to cabinet vibrations. Second in PSI's acronym-fest of technologies is AOI: Adaptive Output Impedance. AOI describes the use of driver-diaphragm feedback in combination with dynamic adjustment of amplifier output impedance, to impose an extra level of control on the way the diaphragms move in response to the amplifier outputs. Now I've always been fascinated by the idea of feedback-control systems in speakers (it was first done commercially, I believe, by Philips in an innovative range of active hi-fi speakers in the 1970s), and I think the idea has great potential. Apart from the occasional hi-fi subwoofer design flirting with feedback control, however, it's an idea that has mostly been left on the speaker designer's shelf. I have nothing but enthusiasm for PSI raiding the shelf and rehabilitating the concept. So, at long last, how does the A25Ms' amalgam of old and new, tradition and high-tech, actually sound? If, like me, you listen mostly to compact nearfield monitors — which, by their very nature have relatively limited low-frequency bandwidth — the first thing that will strike you about the A25Ms is the sense of scale and power that big speakers with extended low-frequency bandwidth (-6dB at 32Hz) can provide. The second thing that might then strike you is a realisation that your room acoustics aren't best suited to speakers that can generate significant acoustic power below 50Hz. This is especially relevant because, with the A25Ms being mid-field monitors and thus likely to be positioned rather further from the listening position than nearfield monitors, the room acoustics will have more influence on what you hear. So, a quick health warning: if you are considering a move to mid-field monitoring, you'll probably want to think about room acoustics at the same time. In my room, which is relatively large and generally pretty well behaved, the A25Ms' low end seemed a touch overcooked, and I used the rear-panel LF EQ control to shelve it down a little for much of my listening. That seemed to help the speakers integrate with the room more consistently. In any other room, of course, things could be completely different. Once I'd got my head around the A25Ms' low-frequency performance (I'm a bass player, so I spent a while enjoying actually hearing the fundamentals below 'A' for a change), I began to investigate the speakers by playing a few very familiar pieces, both from CD and from my Pro Tools rig. This became quite an addictive experience, because the A25Ms are genuinely revealing monitors that can provide great insight into the components of a mix and how they fit together, or not. Their overall tonal balance is, to my ears, a little prominent in the upper-mid band, and this sometimes adds a slight edge to some mix elements (voices and acoustic guitars, for example). However, once I was aware of that characteristic, the ability of the A25Ms to communicate very clearly the architecture of a mix came to the fore. I've no idea if it's the CPR or AOI (or both) that are responsible for the abilities of the A25Ms, or if it was simply good, traditional electro-acoustic engineering that I was hearing, but it seems to me the the number one priority of any monitor design is that it enables us to hear what's what in a mix, and to help us make the appropriate creative decisions. The A25Ms really excel in that regard. 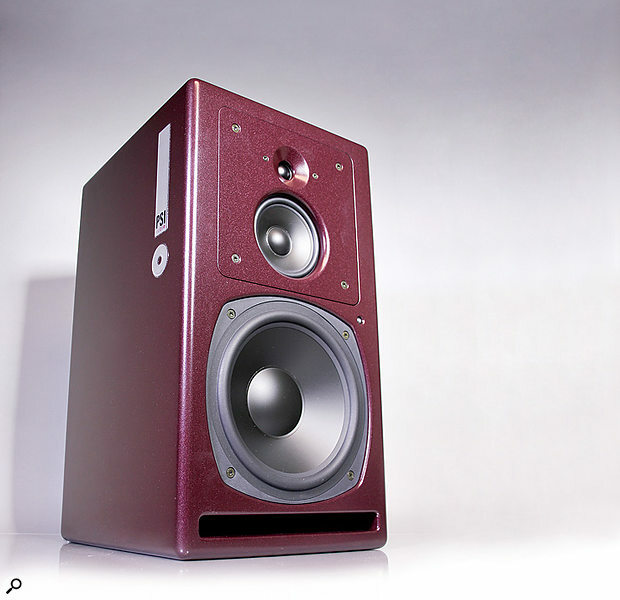 In terms of similarly priced three-way powered speakers, the nearest competitors come in the form of ATC's SCM25As, the Unity Audio Boulders and the Focal SM9s. All speaker systems that use multiple drivers physically spaced apart have an inherent problem with time and geometry. Imagine, if you will, a three-way design such as the A25M with its drivers arranged one above the other. A listener positioned directly in front of the speaker will hear the output of each driver at much the same time because the distance between each driver and the listener's ears is very nearly the same. So, in the frequency bands over which the outputs of the drivers significantly overlap (typically an octave or so either side of each crossover frequency), all is well because the overlapping audio, arriving at the ears all but simultaneously, simply adds together. If, however, the listener moves a bit (maybe he or she stands up to listen), the distances between each driver and the ears change, meaning the discrete outputs no longer arrive simultaneously. Now, without wishing to overdo the imaginings, imagine that the A25M is playing a 3.1kHz sine wave (don't imagine this for too long or you'll have the imaginary listener complaining). At 3.1kHz, which on the A25M is the mid/HF crossover frequency, the signal will be reproduced equally by both the mid-range driver and the tweeter, and thanks to the skill of the PSI engineers, it will leave on its journey from the individual drivers to the listener's ears at the same time and in phase. But, of course, as soon as the listener stands, his or her ears will be closer to the tweeter and further from the mid-range driver, so the two 3.1kHz signals will arrive at the ears at different times, and to some degree out of phase. This will effectively result in a notch in the speaker's frequency response at that listening position. Typically, multi-way speakers that have their drivers arrayed vertically all suffer from vertical-dispersion frequency-response anomalies caused by destructive interference around the mid/HF crossover frequency. Having explained vertical dispersion anomalies, perhaps you're one step ahead of me in realising that if our imaginary listener sits down again and moves horizontally (scooting along stylishly on an imaginary designer chair), things aren't quite so bad, because the relative distances to the ears of the mid driver and tweeter don't much change. So it can be pretty useful, if you wish to mount speakers with vertically arrayed drivers in landscape format, to be able to change the orientation of the mid driver and tweeter. But why just the mid driver and tweeter? What about the orientation of the bass driver and mid driver? It's all about wavelength, you see. At the A25M mid/HF crossover frequency, the wavelength is around 11cm, so for the output of the mid driver and tweeter to be 180 degrees out of phase, the relative distance between the two and the listener's ears needs to change only by 5.5cm — not very much. At the 550Hz bass/mid crossover frequency, however, the wavelength is around 0.63m, so the listener has to move a long way off-axis for the relative distances to change significantly (actually, the relative distance change can never exceed the physical distance between the drivers — around 0.25m on the A25M). At low/mid frequencies, the outputs of the bass and mid drivers never really get far out of phase when the listener moves, so their horizontal or vertical orientation doesn't really matter. Here endeth the lesson. Enclosure colour is an acquired taste. A mix of traditional speaker engineering and innovative electronics results in a genuinely high-performance and rewarding mid-field monitor. Definitely worth investigating. £7382.40 per pair including VAT. Simplifi Audio +1 858 414 3900.